Today is the 100th birthday of noted urbanist Jane Jacobs. It’s hard to reduce someone as prolific as Jane Jacobs to a single book. She accomplished so much more than that over her career fighting for better cities—she stopped an elevated highway from crossing Manhattan that would have destroyed large swaths of cast-iron Soho and Washington Square Park. She was instrumental in protesting the demolition of the monumental Penn Station that helped spark the modern preservation movement in New York City. She redefined the notion of how streets work and why people love them. But she also wrote Death & Life of Great American Cities—and that’s also no small achievement. 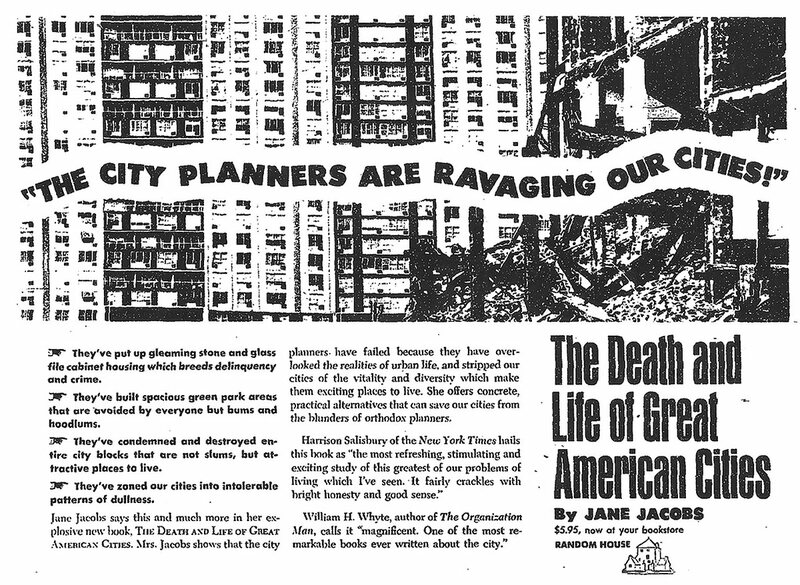 When the hefty tome was published 55 years ago in 1961, it was a full assault on the planning structure of the day that was giving shape to lifeless plazas and parks, faceless skyscrapers, bulldozing entire neighborhoods, forcing highways through thriving neighborhoods, and generally killing off the life of the city. While many of her views in the 1950s and ’60s were considered radical, they’ve become the norm for urbanism today—mostly. We still fight today many of the same battles that Jane Jacobs fought half a century ago against the same power structures that would remake cities in ways they see fit, without consideration for all the nuances that make cities great. And we’ll likely continue to fight those battles for some time to come. But today, the accomplishments of Jane Jacobs deserve special attention. Today is her 100th birthday. One hundred years ago, May 4, 1916, Jane Butzner was born to a doctor and a nurse in Scranton, Pennsylvania. After moving to New York City in the Great Depression and marrying architect Robert Hyde Jacobs, Jr. in 1944, Jane’s ideas of city life would be indelibly marked by the streets of Greenwich Village, which deviate sharply from the grid of 1811 that defines the rest of Manhattan. On these human-scaled streets, Jacobs would observe what made the city tick and she would come to figure out why she loved it so much. She moved around on foot and bike—she saw the city first hand at a speed where you could easily make out its details and learn its secrets. And while it’s doubtful that Jacobs ever saw Louisville first hand, she did know of our city through the correspondence of our own great urbanist, Grady Clay. In 1958, Jacobs wrote a lengthy article published in Fortune magazine called “Downtown is for People,” where she cautioned about careless development that was destroying cities across the country. We wrote about that article here. Instead, she pleaded for us to get out on our own two feet and look around the street for ourselves. “The best place to look at first is the street,” Jacobs said. “The street works harder than any other part of downtown. It is the nervous system; it communicates the flavor, the feel, the sights. It is the major point of transaction and communication. Users of downtown know very well that downtown needs not fewer streets, but more, especially for pedestrians.” It’s no accident that “sidewalk” plays prominently in name of this very publication. 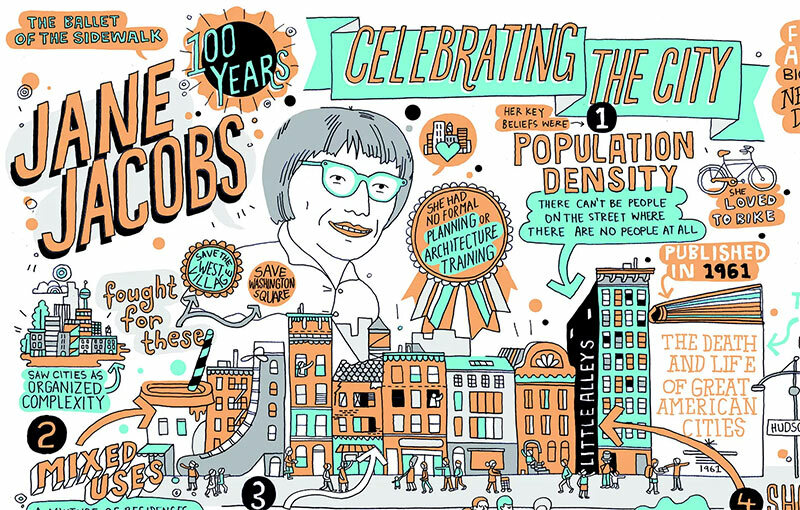 An illustrated guide to Jane Jacobs, published today by Curbed. Louisville plays a more direct role in Death & Life. Grady Clay had been corresponding with Jacobs about a thriving shoe market on the edge of Downtown that offered half a million pairs at any time. It had grown up organically, without any help, and was drawing people from distant cities to browse its shoe offerings. Today, only Pix Shoes at Market and Preston streets remains of the once thriving district. The rest of that part of town is highways and parking lots. But while Louisville and every other city had to fight its own battles the same time Jane Jacobs was fighting to save New York, her words and high-profile actions helped give credence to the notion that urbanism matters. We now know Jacobs was right about how cities work, and whether we choose to act on her recommendations or not, we’re better off for having them. And we’re thankful that she lived an exemplary life in deed and word. Well… I can tell you first hand of the damage that this Jacobs woman did to hundreds of thousands of commuters each and every day. Rather than “Happy 100th”, we are saying “GOOD RIDDANCE” to this Queen of Gridlock. She costs millions of Canadians hours of wasted time every day away from their family, friends and work and she also has cost us billions of dollars in lost productivity and wasted fuel. Why anyone in their right mind would even think of this woman is far beyond us – the hard working public who has to suffer because of her selfishness and hatred of the car. Perhaps if you are a scholar and just sit in utopia away from the real world, well… then I could understand it. But when you have to deal with the mess she left behind in Toronto, it’s quite a different story. The biggest mistake our nation ever made was letting her into our country. Don’t believe me? Then just ask around – she is not well liked at all!